Lily likes to put on her beach hat and say 'Let's go to the beach mommy'. Good idea sweetie, mommy loves the beach too. Talk to daddy. We were treated to gorgeous weather for Holden's first birthday celebration and through the week but a new cold front swept in this morning and we are back down to freezing temps and drizzle. Try staying inside all day with four toddlers. Actually we brought two more toddlers over this afternoon for a playdate which somehow made things easier. All six were having a blast without much need for us grownups to entertain them. I'd post my pics but my photo download is not cooperating. I'll try again tomorrow. I'm off to bed and hope my dreams send me someplace sunny and warm. 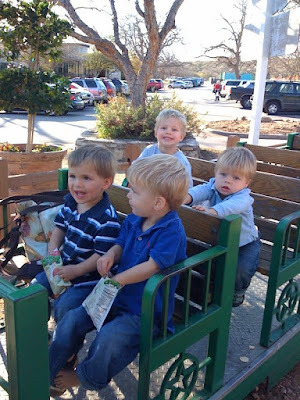 Riding the train with our friends Rowan and Devin on a warm sunny January afternoon. 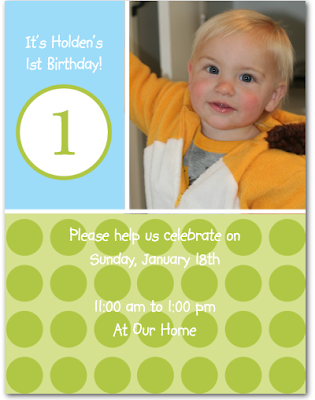 Holden is a very happy baby and social. His first word was 'hi', followed by 'bye'. Soon after he learned to say 'cat' and 'duck'. The toddler parenting book i'm currently reading says that often the most content and social babies first word is 'hi' which was true in our case. He took his first steps early, around ten months but started walking about a week before Christmas. He was an adept walker by the new year. Happy Birthday to my mom GG! She has been visiting with us since Christmas but took a short vacation with some girlfriends from school days and even from the same brownie troop. We will celebrate when she returns on Friday. But I wanted to write a short note how thankful I am to have a loving mom who is so involved in our children's lives. Here she is Christmas morning with one of the handmade quilts she made the kids. They are beautiful, the boys quilts are blue and browns and have cars and trucks. Each quilt has different fabrics for the boarders and back. And for Lily she made a colorful butterfly quilt with 'happy colors'. The kids know that their GG made them and like to cuddle up with them at night and trace the cars or butterflies. He was sweet as a doll and now he looks sharp for his birthday. Jessica helped me clean out and reorganize all our toys yesterday. It was a huge success. She had some simple but extremely helpful ideas that allowed me to corral our toys and provide gobs of entertainment. First we sorted by type and had bags for trash and give away. Then we created stations on the bookshelves with a few categories of toys, books, colors and shapes, animals, puzzles, legos and cars each labeled clearly. I took photos which I am to print out and add next to the signs to help the kids know where to store the toys at clean up time. We selected only a few items for each category and put the rest away for toy rotation. For the books section we displayed about a dozen books with the covers out and were sure to only put enough that it wouldn't overwhelm or take too much time to put away should someone decide to knock them all down. We used the three large drawers under the window seat for additional toy storage. Before this endeavor they were full to the brim, now we have one drawer dedicated for baby dolls with a bin for clothes and a bin for bottles and other accessories. Now Holden has a dedicated drawer with about ten of his toys laid out. The third drawer had our remaining toys in larger freezer bags, people, animals, 'my little ponies'...etc, that we can easily access to create new toy 'scenes'. Under the bed in Holden's room I have more toys for rotation in bins, the extra puzzles and blocks, play puzzle mat, and extra books. In their closet I put all the dress up clothes in another basket and all the non special lovey stuffed animals in its own basket, along with our tent and sleeping bags. Then Jessica staged the room with a few other activities. She recommends that every three days I set up a different activity on the train table. Yesterday she stacked large plush cubes and displayed dinosaurs all around. Lily ended up waking up before the boys and spent a good 45 minutes playing with this set up. Her other ideas were to set up a tea set or people and houses made from boxes, etc. It was a lot of work but with Jessica's help we were finished in under three hours. I had three big bags for giveaway and a load to the trash. The true test was when the kids woke up. They had a blast playing and exploring their 'new' toys. With a bit of coaxing they even helped clean up. We didn't need to turn on the TV yesterday for distraction, they stayed busy with their toys. In the middle of the night when I checked on them I was able to easily grab the animals and Legos and put them in their room. This morning, they were happily playing with their toys which gave me enough time to get dressed and start the coffee before going to get them. Bliss.